Have you ever turned around and realized that your child is not there? Even if it's just a couple of minutes before you are reunited, the anguish is intense. This has happened to me at a Mardi Gras Parade with my middle son, thank goodness it was only for about 5 minutes but those minutes seemed like hours. It's not easy keeping tab on your kids in a crowded public area and sometimes kids wander away like my son did. Kimberly Martinez is a ‘Momtrepreneur’ who lost her son at the beach for almost 25 minutes. Thankfully, her son was found and returned safely to his mother's arms. After that harrowing experience, Kimberley designed the Guardian Angel Bracelet ID - a waterproof, durable bracelet that you can write your phone number on in case your little one gets lost. Using the Guardian Angel Bracelet ID is simple. 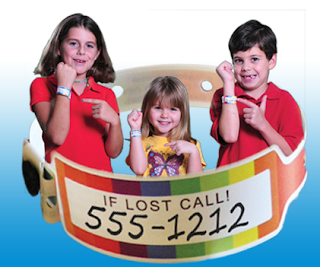 All you need to do is write your cell number or the child's caregivers number and snap it securely on your child's wrist. They also suggest that you teach your child to approach the first mommy they see if they do become separated from you and ask that they call the number on the bracelet. 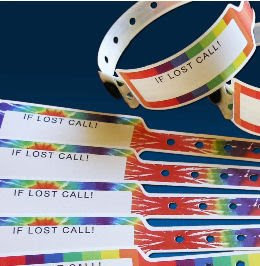 I think the Guardian Angel Bracelet ID is a great idea ! They are really easy to use too. They remind me of the bands you would wear at an amusement park, and they require someone to cut them off. I love the bright colors of the bands. Since there is no way my 2yr old can remember my cell phone number or the cell number of who he is with (dad, grandmother etc...) This is a great item to use with him. I really like that you can write a number on each one and it is not printed on it. My mother in law enjoys taking the boys places so on a day she takes them for a day of fun her number can be placed on it. I received the Guardian Angel Family Pack which contains 10 bracelets for $9.95. It also comes with a waterproof marker and some safety tips. They also carry a Guardian Angel Classroom Pack (30 bracelets) and Guardian Angel Group Pack (100 bracelets). To purchase any of the Guardian Angel Packs, please visit their website. SAVE: 20% enter code "blue" until July 21st. I thought I lost my son before and it was so scary! This is a great idea. Been there and done that before and I felt like I aged ten years during the whole episode. Wow! I wish they had had them when I was teaching preschool. I would have bought a classroom pack for when we went on field trips. And I definately would have used them for my own children....it is even more important in this day and time...you just can't be too careful!